The Severn Vale, through which flows the country's longest river, is famous for its tidal bore, Blaisdon Plums and Perry Pears. The old Severnside port of Lydney is the area’s main town, and is a thriving business and shopping area. The River Severn ( Welsh:Afon Hafren ) is the longest British river, at 354 kilometres (219 miles) long; it rises at an altitude of 610 metres on Plynlimon near Llanidloes, in the Cambrian Mountains, Mid Wales, and it passes through a number of English counties, with the county towns of Shrewsbury, Worcester, and Gloucester located on its banks. The Severn becomes the Bristol Channel at its estuary, eventually discharging into the Irish Sea and the Atlantic Ocean. With an average discharge of 107 m³/s at Hawbridge (Worcestershire), the Severn is England´s largest river in terms of water flow. The Severn's drainage basin area is 11,420 km2. It is one of the ten major rivers in the United Kingdom. The Severn Tunnel carries the Great Western Main Line under the estuary. The two bridges of the Severn crossing carrying roads (opened in 1966 and 1996) link Wales with the southern counties of England and are among the most important in Britain. The Severn is bridged at many places, and many of these bridges are notable in their own right, with several designed and built by the engineer Thomas Telford. A six-mile stretch of the Severn Valley in Shropshire, known as the Ironbridge Gorge, was designated a World Heritage Site by UNESCO in 1986. Its historic importance is due to its role as the centre of the iron industry in the early stages of Britain's Industrial Revolution. Ironbridge gets its name from the bridge across the Severn, built in 1779, which was the first cast-iron bridge ever constructed. According to some sources, the name "Severn" is derived from the name Sabrina (or "Sabern"), based on the mythical story of the drowning of a nymph in the river.A tributary of the Severn, called the River Teme, joins it just below Worcester and above Kempsey. One of the several rivers named Avon joins the Severn at Tewkesbury, Gloucestershire. That same Avon also flows through Stratford-upon-Avon. The port of Bristol is located at the mouth of the Severn, where another River Avon flows into it. Between Gloucester and the Welsh border at Chepstow is the Forest of Dean flanking the north bank.The Staffordshire and Worcestershire Canal, the Worcester and Birmingham Canal, the Droitwich Canals and the Herefordshire and Gloucestershire Canal are joined to the Severn. A curious phenomenon associated with the lower reaches of the Severn is the tidal phenomenon known as the bore. 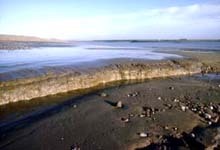 The river's estuary, part of the Bristol Channel, has the second largest tidal range in the world - about 15 metres, exceeded only by the Bay of Fundy in Canada - and at certain combinations of the tides, the rising water is funneled up the estuary into a wave that travels rapidly upstream against the river current; enthusiasts even attempt to surf along on the wave. (Note that the Gloucester Harbour Trustees, as competent harbour authority for this part of the river, explicitly advise against this pastime.) The Severn Bore is a natural example of a self-reinforcing solitary wave or soliton. The bore forms somewhat upstream of the Port of Sharpness, which is also the Southern terminus of the Gloucester and Sharpness Canal. The canal was built in the 1820s to enable safer passage of trading ships to Gloucester. Just North of the Port are the remains of the Severn Railway Bridge, which bridged the river until it was badly damaged in a ship collision in 1960. Between Purton and Sharpness is an area known as The Ships' Graveyard, where many disused barges were scuttled along the bank to reduce erosion, which was threatening to destroy the banks of the canal. Several of these barges have 'concrete' sides and were intended for use in World War 2; there have been plans to restore some of them, as of historical interest. The sides of the estuary are also important feeding grounds for waders, notably at the Bridgewater Bay National Nature Reserve. The old Severnside port of Lydney is the area's main town, and is a thriving business and shopping area. Steeped in history, abundant in local food, rich in culture, and bursting with spectacular scenery, the Forest of Dean offers you the chance to discover a part of England unlike any other. Why not stay for a few days to fully explore the very best that the Forest has to offer.